Looking for your next vacation spot? The Château d’Urtubie, a stunning castle that dates back to the fourteenth century, is now a hotel in the heart of the Basque Country. Come take a trip to St-Jean-de-Luz, a beautiful resort town along the Atlantic in the Basque country of southwest France. Don’t forget to bring a towel! Discover the charms of the city of Chartres with our famous guide, Daniel Benchimol! With medieval roads, a famous cathedral, and the International Stained Glass Center, Chartres is a must-see destination for your next trip to France. The cathedral of Chartres is one of the most famous in Europe and is a prime example of Gothic architecture. Daniel Benchimol gives us an exclusive tour of this magnificent cultural landmark. Daniel Benchimol shows us around Cabourg in Normandy. There, you'll find a casino and the famous Grand Hôtel, where Marcel Proust stayed and found inspiration for his book In Search of Lost Time. Daniel Benchimol continues his tour of the Normandy coast with stops in Tourgéville, Houlgate, and Dives-sur-Mer. Along the way, he shows us some interesting houses built on top of German bunkers from World War II. Deauville, one of the most prestigious resorts on the Normandy coast, is a movie lover's dream: besides featuring an annual American film festival, it was also the filming location of A Man and a Woman, a classic of French cinema. Honfleur is a Norman town whose beauty was immortalized by the Impressionists. Come take a trip with Daniel Benchimol through this historic town that inspired an entire art movement. Daniel Benchimol takes us on a stroll through Trouville, a town in Normandy that's famous for its boardwalk. A favorite of novelist Gustave Flaubert, this charming town also boasts some beautiful villas, a fishing port, and delicious restaurants. Daniel Benchimol takes us through the village of Barbizon, which has served as an inspiration to numerous artists and writers since the mid-1800s. Pierre-Auguste Renoir, Claude Monet, and Robert Louis Stephenson are just a few of the many people who have fallen in love with this charming town. Daniel Benchimol visits Fontainebleau, a town south of Paris that many French kings visited. Its magnificent Renaissance style castle was Napoleon's favorite residence. The Cathedral of Notre-Dame de Reims is one of the finest examples of Gothic architecture, and it's just one of many interesting things to discover in the northern French city of Reims. Daniel Benchimol walks us through this gorgeous city in this video. Daniel Benchimol continues our tour of Reims. You'll not only see the Cathedral, but a lot of intriguing architectural styles, art deco buildings, and a fifties structure merged with a medieval tower. 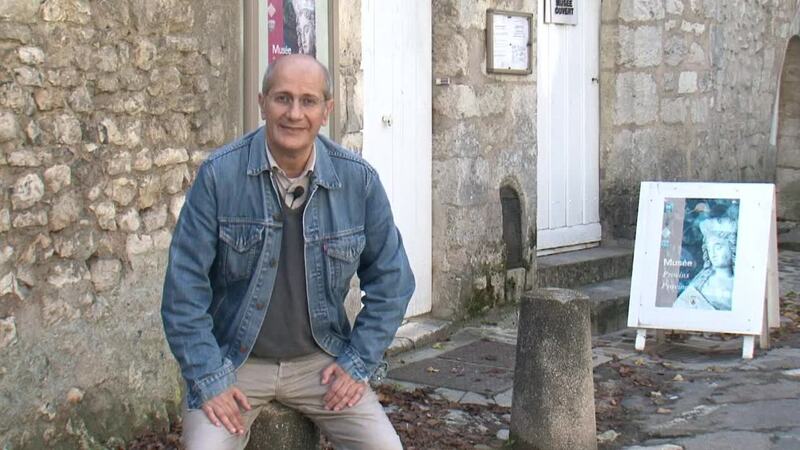 Daniel Benchimol is in the charming little town of Saint-Mammès, south of Paris. Its unique location at the confluence of the Seine and the Loing was a source of inspiration for the famous impressionist painter born of British parents, Alfred Sisley. In this episode, Daniel Benchimol takes us to the Bois de Vincennes, a beautiful green area on the outskirts of Paris. There, we will discover the impressive Vincennes Castle, a tropical agronomy garden, a British-style phone booth, and the highest Buddhist temple in Europe. Daniel Benchimol takes us to the quiet village of Carrières-sur-Seine, a mere twenty kilometers from Paris. He points out a fun bench called Le banc des menteurs (The Liars' Bench), where one can sit and presumably tell lies until closing time at 7 p.m. Then the liars can take cover in one of the nearby cave dwellings carved straight out of the cliffs. Daniel Benchimol is in Saint-Germain-en-Laye, where France's King Louis XIV was born. The Parisian suburb is also the site of the summer art exhibition Nouvelles folies à la française (New French Follies). This year's exhibition includes, among other things, a giant four-poster bed floating in the middle of a fountain! A few kilometers from Paris, on Chatou Island (also known as Impressionists' Island), Daniel Benchimol has a nice surprise for you.... Watch this video to find out what it is! In this tour of the town of Saint-Germain-en-Laye, you will discover a very old castle built by King Francis the First as well as a quintessentially French marketplace, whose numerous fountains make it the perfect place to cool off in the summer. In this episode, Daniel Benchimol takes us to the little Gallo-Roman city of Senlis, forty kilometers away from Paris. There, we can discover its fish and vegetable market, its church, and its art and archeology museum. Daniel Benchimol continues his tour of the medieval town of Senlis with a look inside the Notre-Dame Cathedral, which is considered to be one of the most beautiful examples of Gothic architecture in France. The cathedral contains a magnificent organ and a plaque commemorating the British soldiers who died in France during World War I. In this third episode on the medieval town of Senlis, Daniel Benchimol introduces us to the Venery Museum or hunting museum. The museum displays not only traditional uniforms of the Spahis but also the special architecture, painting, music, and art linked to the "venery" activities. Our trusty guide Daniel Benchimol takes us to the outskirts of Paris to the medieval city of Provins. There you can admire its ramparts that are still intact in places, enjoy its equestrian shows, and follow the historic road to Paris on your way back. In Part 2 of his tour of Provins, Daniel Benchimol takes us to a unique show called "The Eagles of the Ramparts." In this very exciting show, we can see the different kinds of birds of prey and how they are trained to hunt in flight in the heart of the medieval city of Provins. In this third episode on the medieval town of Provins, Daniel Benchimol shows us a monument coming from Brazil, an old synagogue, and a beautiful church where Joan of Arc attended mass with King Charles the Seventh. He also gives us a glimpse into Provins real estate, with a beautiful house that has been estimated at a modest price of six million dollars! In this fourth and final episode on the medieval town of Provins, Daniel Benchimol takes us inside the Tour César (Caesar Tower). From this tower, you'll have an amazing view of the whole city and its surroundings. You can also climb up the tower and discover its three-ton bell. Daniel Benchimol braves the freezing temperature to show us around the beautiful medieval town of Gisors in the Vexin region in the north of France. The highlight of the town is its eleventh-century castle, which is currently undergoing major restoration work. The castle was once surrounded by a moat, and some of its towers still remain, with imposing names like "Prisoner's Tower" and "Chilly Tower." There's a lot to explore in the Saint-Gervais-Saint-Protais Church in Gisors, including a towering wooden organ, a magnificent mural, and a spiral staircase. Daniel Benchimol gives us a detailed tour of this stunning work of architecture, which he counts as one of the most beautiful churches in Normandy. In the last part of his tour of the town of Gisors, Daniel shows us an interesting structure called a cabinet de verdure (greenery chamber) as well as a waterfall that served as the major driving force of the town's economy for centuries. Daniel also tells us the story of Philippe Auguste and the Golden Virgin, which you won't want to miss! Daniel introduces the charming town of Compiègne and its magnificent City Hall. In the City Hall building, you'll find the Bancloque, a fourteenth-century bell that still rings today with the help of three automated figures called jacquemarts that "poke" the bell on the hour. And make sure to stop by the burger kiosk on your way out of the city for a delicious, locally sourced treat! As Daniel explains, Joan of Arc is a bit of an "obsession" among French people, and tributes to her can be found in many towns across France. Compiègne has particularly close ties to the country's patron saint—after assisting the town in its fight against the Burgundians, she was captured by them in 1430. In the third installment of Daniel's tour of Compiègne, he shows us the magnificent Saint Jacques Church, which happens to be a stop along the Way of St. James. He also takes us to some former salt warehouses and to a beautiful garden surrounded by medieval walls. In the final installment of his tour of Compiègne, Daniel takes us to the "Haras National" (National Stud Farm), where some of the most prestigious horses in France have been raised since the 1700s. He also shows us the Imperial Theater, built by Napoleon III, and the Museum of Internment and Deportation, which commemorates the prisoners of the Royallieu concentration camp. Daniel takes us to the town of Conflans-Sainte-Honorine, located around thirty kilometers from Paris, which is known as the capital of canal transportation. You'll see some beautiful barges and cruise boats, as well as a public toilet that Daniel calls an "aesthetic success"! In the second part of his tour of the town of Conflans-Sainte-Honorine, Daniel shows us the Montjoie Tower, a Romanesque dungeon whose walls are still standing today. He also takes us to a beautiful garden filled with rare plants. Daniel shows us around the old quarter of the village of Conflans-Sainte-Honorine, a charming area that dates from the Middle Ages and contains some beautiful gardens and courtyards. Some of the streets and alleyways have even retained their medieval names, such as the "Rue de la Savaterie" (Cobbler Street). Daniel concludes his tour of Conflans-Sainte-Honorine by taking us along the quays to see some of the barges that are docked there. Among them, you will find a houseboat that doubles as a chapel and the last tug boat ever built in France! In this first part of his tour of Rambouillet, Daniel shows us the town's beautiful castle and its surrounding forest, islands, and gardens. Do you know what a "quincunx" in a garden is? If not, you'll find out in this video. Daniel takes us to the Rambouillet castle, which includes a very interesting building on its grounds: the Laiterie de la Reine, or Queen's Dairy, which was built for Marie Antoinette in accordance with the "pleasure dairy" trend of the eighteenth century.